BAY MINETTE — Baldwin County Commissioner Chris Elliott said he knows development at Interstate 10 and the Baldwin Beach Express is coming, but isn’t sure it’s the right time to rezone property there. At its Oct. 17 regular session, the commission did vote to rezone four parcels north of the interstate there from residential to major commercial in what was Elliott’s last meeting as chairman. A huge Buc-ee’s travel center is already planned for the southwest corner of the interchange on County Road 68. 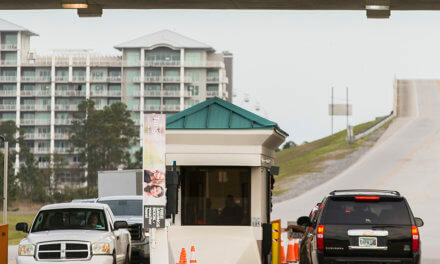 Buc-ee’s is a Texas company with 32 convenience stores and travel centers and is planning expansions into Alabama and Florida. Also looming large in this area is the county’s planned 24-mile extension of the Baldwin Beach Express from I-10 north to I-65. When the first parcel came up for discussion, Dorsey made a motion to table it until Nov. 7, with Elliott providing a second. Commissioner Skip Gruber then said he felt it was time to vote on the first rezoning, with the other three to follow. He said worrying about costs to the county for improved roadway access to the parcels was premature. Dorsey’s motion to table was voted down and a motion was made and passed 4-0 to rezone the first parcel. “Commissioner Gruber has convinced me,” Dorsey said. “Let’s move on with it.” The next three were OK’d 3-0 with Dorsey abstaining on those three. The four parcels rezoned are the Malone at 5.7 acres, Kramer at 13.3 acres, Stuart at 14 acres and Hayes at 14 acres as well. Each property currently has a dwelling and other buildings. The Hayes property is already on the market and it is anticipated the others will be for sale soon. County Planning Director Vince Jackson said a fifth parcel at the interchange is on the November agenda, also seeking to rezone to major commercial. That parcel, Jackson said, is right next to one of the on-ramps. Officials with Buc-ee’s say the Baldwin County location will have 50,000 square feet of retail space and 120 gas pumps, and provide about 200 jobs. There are also plans to expand County Road 68 to allow access to the store, officials said. Elliott ended his term as chairman of the commission and will pass the gavel to Commissioner Frank Burt at the Nov. 7 meeting. Burt is running for re-election, while Elliott is seeking Trip Pittman’s seat in the State Senate. The four commissioners rotate the chairman position each year. PreviousWill council drama leave Fred in charge?